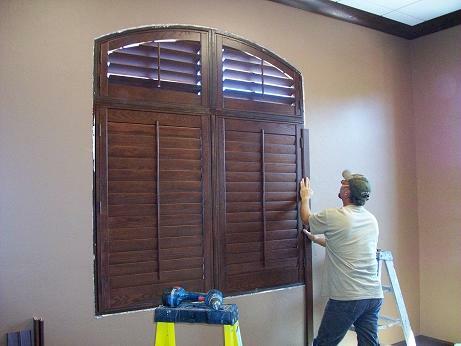 At Kirtz, we manufacture custom plantation shutters that are built to size for the windows in your home. Once you make the decision to invest in Kirtz plantation shutters, you’ll want to ensure our trained shutter installation expert installs your custom shutters. The shutter experts at Kirtz offer measuring and shutter installation services in Oklahoma, SE Kansas and NW Arkansas. If you live outside of this area, please call us and we will try to recommend a plantation shutter installer that we trust. Or you can check online for a recommended shutter installation service within our dealer network. For our valued customers installing shutters outside of our local service area, we recommend you purchase through our dealer network. If there is not an active Kirtz dealer in your area we will try to recommend a trusted shutter installation service. Additionally, our factory installation representatives are available for on site installation of Kirtz Shutters worldwide. For more information contact us at 800-416-6455.